Navigate your way through lotus flowers and ancient dragon statues in the Emperor’s garden, an adventure into the elusive history of the far-east. Defeat the rule of China in this online 5 reel slot game and earn your free spin and pay line fortune. NextGen credits itself for being an experienced developer of successful games for slot online and land-based markets around the world. They stand by the motto: Attract, Entertain, and Retain. They apply this to their forever growing community of slot games and with 18 years of experience and a strong and established reputation, there’s no wonder they have had such a great success with their content. 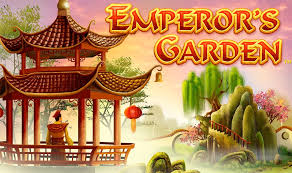 Creating refreshing ways to make people revisit casino new slots game repeatedly is not an easy thing to do but NextGen makes it look easy with one of their creations, Emperor’s Garden. 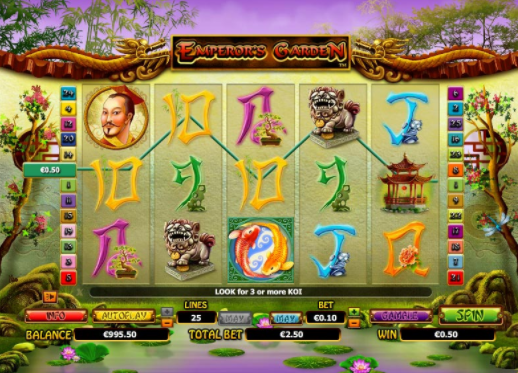 The smooth animation and calming colours of this ornamental theme make this slot-game a pleasure to the eyes from the outset. The lilac purple sky contrasted against the leafy green tress added with the entwining branches around the reels and the soothing pond allows you to immerse yourself in this vast garden. The Emperor appears to need some help in maintaining this garden and you were the only person willing to attend to his fussy demands. However, no need to fret, as he does reward you handsomely if you manage to salvage his collection of ornamental letters and numbers, pergolas, dragon statues and lotus flowers. What is aesthetically pleasing about the symbols is that it is very Mahjong style, complimenting the game’s theme perfectly. Finding 3 of the same following symbols: A, K, Q, J, 10 and 9 as you walk around the garden will reward you between 5 and 250 times your original wager. By finding 5 of either the lotus flowers and pergolas, the Emperor’s generosity increases to 1,000 times your stake. If this wasn’t enough, the Emperor has also hidden 5 of his own symbols and finding these will provide you with 5,000 times your stake. With a minimum bet of just 1p and the max, £2, it is crazy to think how much money you would receive from just the minimum bet! There is also the chance to play two bonus games, which will increase your fortune without a doubt! When the gardens become overgrown and wild, there will be prizes up for grabs as the Wild Garden symbol fills the entire reel that it appeared on. The free games feature will be triggered by the discovery of 3 Koi Carp – this is your scatter symbol and 10 free games will be awarded and all prizes are multiplied by 3 during these free games! There is also a gamble feature which you can have access to everytime you hit a winning combination – perfect for those who play games to relish the adrenaline of risk! Visit Easyslots.com for the full range of slot promotions. Despite having to deal with a high maintenance emperor and catapulted into an unfamiliar world, the emperor does reward you graciously and NextGen does a marvelous job in making it a smooth transition for both the eyes and mind. 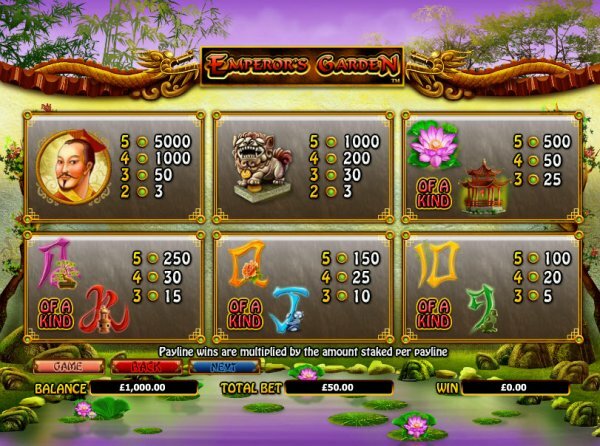 A simple and enjoyable slot-game which starts at just 1p per spin, earn those green fingers today and win big! View here our popular online slot games. For more information, refer to easyslots.com!